The Food and Drug Administration (FDA) mandated a stricter peripheral neuropathy (nerve damage) warning on fluoroquinolone antibiotics like Levaquin, Cipro, and Avelox on August 14, 2013. This additional warning opened the door for lawsuits against the makers of these drugs for product liability, failure to warn, negligence, and other causes of action. Users of the popular class of antibiotics known as fluoroquinolones may face an increased risk of permanent and irreversible nerve damage, known as peripheral neuropathy. Lawsuits for users of Levaquin, Cipro, Avelox and other similar antibiotics are being reviewed by lawyers nationwide. 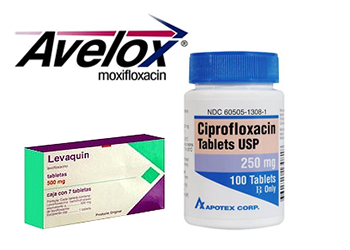 Levaquin, Cipro and Avelox are antibiotics known as fluoroquinolones used to treat bacterial infections of the skin, sinuses, kidneys, bladder, or prostate. They are also used to treat bacterial infections that cause bronchitis or pneumonia, and to treat people who have been exposed to anthrax. If you or a loved one has suffered an injury related to the use of Avelox,Cipro and Levaquin (Antibiotics), you may be able to seek compensation for your injuries with a lawsuit. Fluorquinolones are the most widely used class of antibiotics in the United States, with more than 23 million patients per year receiving prescriptions for the medications in pill form and another three million receiving injections. Although the antibiotics are promoted as safe and effective, side effects have been linked to a risk of peripheral neuropathy, which may leave users with a form of permanent nerve damage that attacks the peripheral nervous system.